Dear, sweet Jesus… You’d think that Microsoft’s built-in “Backup and Restore” feature in Windows would just kind of work. If you’re still having problems with failing backups – especially if you get the error “The system cannot find the file specified. Error 0x80070002” – then read on. There are other solutions to this problem available on the web. For example, you can try the Delete Extra Profile Entries in the Registry Trick. I did, but it didn’t do any good. When you’re done, probably you’ll get the little Explorer window that pops up when you connect a new drive or USB stick. Just close it. You really shouldn’t touch the System Reserved partition, unless you like screwing up your computer! That’s why it’s hidden by default: so you can’t screw it up. However, now try to rerun Windows Backup. Most likely, it’ll work just fine! See? I told you that you’d be happy. Now comes the crying part: You’ll have to live with your System Reserved partition visible in Computer along with your other drive(s), which is just goofy. Like I said, it’s supposed to be hidden, and you shouldn’t ever really touch it, copy files onto it, or anything like that. So, the fact that the “fix” for this problem is to assign a drive letter (thereby “unhiding” it) is downright retarded. Excellent work, M$… Almost as good as the “Start Screen” in Windows Not-So-Gr8. 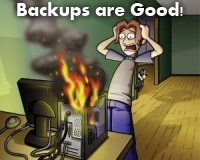 But at least your backup is working again! I tried the shadow copy solution, I can’t apply this solution because there is not a portion of my drive named “System Reserved”. I do see a section titled “Primary Partition”, when I right click on it, my only option not grayed out is to delete it. Please help me! !